"She had long thighs and she walked with a certain something I hadn’t often seen in bookstores." Haunted by John McFetridge's comment about voice and story here at Detectives Beyond Borders and consumed by desire to revisit the greatest mutton-fat simile in American crime writing, I read The Big Sleep again on Saturday. McFetridge wrote "I think voice is really important in a story but not as important as the story," which sounds at once reasonable and at odds with the wisecracking American P.I. tradition that Raymond Chandler perfected for eternity. So I kept my eye on story this time, and McFetridge was right. The pathos of the story and the depth of the Sternwood family's pride and self-delusion get more affecting each time I read The Big Sleep. 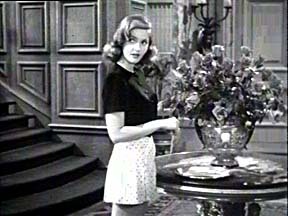 The novel also increased my wonder at Howard Hawks' celebrated 1945 and 1946 film adaptations. Aside from minor details of hair color and such, the performers — and the cast is a strong one — are dead ringers for Chandler's versions of them. And the movie's additions either are plausible extrapolations from the novel (the racy horse-racing dialogue between Lauren Bacall and Humphrey Bogart) or good, solid action in their own right (the end of Eddie Mars). My guess is that the former is due to the movie's writers, who included Leigh Brackett and William Faulkner, and the latter to director Howard Hawks. Oh, and the novel's plot is less confusing than the movie's, if that matters. Yes, all is true, but voice (style) and plot (plus characterization, setting, and other elements of fiction) must combine properly proportioned and blended in the proper recipe or the cake will remain not edible, not matter how beautifully it is decorated; too many Chandler imitators have not learned that lesson. Moreover, thanks to you, I will revisit Chandler's novel later today. I agree with R.T. It is the blend. 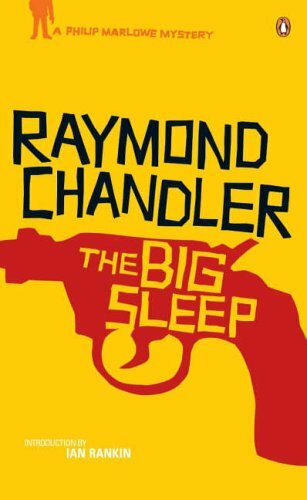 I love Chandler's novel "The Big Sleep" and I've reread it several times over the years. I also like the film and I've seen it several times. But I think James Garner best captured Chandler's character Philip Marlowe in 1969's "Marlowe," which was based on Chandler's "The Little Sister." Garner looks much more like Chandler's Marlowe than ole Bogie. Garner is big, tough and handsome like the novels' character. Garner also smokes a pipe and is very good with the wisecracks. He has Chandler's voice down. I only wish that the film was a 1940s period piece. Have you seen the film or read "The Little Sister"? Chandler's friend Ian Fleming also wanted Cary Grant to portray his character, James Bond, on the big screen. R.T., well yes. An excellent novel will combine plot, setting, character, and so on. The test in this case is what you'll get if you ask someone to write a page in Chandler's style. I occasionally got the feeling reading The Big Sleep that Chandler would occasionally toss in the extravagant similes just for fun. Who says a writer has to be single-minded about his task? Who says he can't have a bit of a joke, too? Paul, I have read The Little Sister, and what I remember most is how it was shot through with, and even marred by, Chandlers' disillusionment with Los Angeles. I'm reading The High Window now. In re who would make a good Marlowe on screen, a Chandler-loving friend has expressed regret that Robert Mitchum did not get to play Marlowe when he was younger. Yes, Mitchum would have been very good as Marlowe when he was a young man. He portrayed Marlowe twice as an older man. A remake of "The Big Sleep" (which I didn't care for) and "Farewell, My Lovely (which I did like. Mitchum was good as Marlowe, but, alas, he would have been great as Marlowe when he was a young guy. The Farewell, My Lovely that included a young Sylvester Stallone! Both are classics that I've read and watched into the double figures. Adrian: I finally tied my dissatisfaction with the Coen brothers to my dislike of pop culture references to pop culture. I almost never like passages in crime novels where an author writes something like "If this were a movie or a detective story, he would ... " And once I realized what the blowing hat in Miller's Crossing, my assessment remained precisely what it had been before: "What the hell is that nonsense with the goddamn hat?" And do you know offhand what the first crime story or movie to use The Big ____ in its title? I dont. But I have used The Big Sheep a couple of times. The Big Crock would be a delightful play on The Big Clock, if this degenerate culture of ours would recognize the allusion. No, but thank you for sharing. Peter, there is The Big Bow Mystery by Israel Zangwill, a short novel, short enough to be anthologized a few times, published in 1892, and also the first locked-room mystery. Really very good, not the least for having a measure of humour in it. I knew Zangwill was, among other things. an early writer of mysteries, but I never knew any of them was The Big anything. Thanks. I do think Zangwill's other writings and work of more interest than his mysteries, Peter. But 'tis a curiosity that The Big Bow Mystery was used as the basis for three movies, in 1928, 1934, and 1946. Clive Brook and Otto Kruger in the first two were significant actors, but 1946's The Verdict furnishes a link with the earlier part of your post, for that featured Peter Lorre and Sydney Greenstreet. A pity reviews of it are so generally discouraging, but still worth a look, I suspect, if one can find it. Thanks. In another Chandler-related matter, if Zangwill knew Yiddish, he may have known the expression 'hoiche fenster,' or `high window,' used, apparently by lower-middle-class and poor people to refer to the houses of the rich. I feel sure he did, Peter. The Big Bow Mystery was his only work of crime fiction, though a crucial one. But he was a fine and prolific writer in other genres from humorous newspapers pieces to studies of great literary figures. One of his plays was turned into a musical in 1979! But the work I'd like to get, a most famous one in its day, is Children of the Ghetto: A Study of a Peculiar people, published in 1892. Add to all this his rather futile territorial campaign rather than for Zionism, and I think we have here a significant writer and thinker quite overlooked. One interesting thing he did here and there was express Yiddish sentence structure in English. I'd like to see that as well. I think first I'll take a look in Google Book Search.